Inlays and onlays are great solutions that can restore, strengthen and enhance your smile the same day. Book an appointment with Redlands Gentle Dental Care today. Receive treatment and see the results in one and the same day. Natural looking tooth restorations matched to your individual tooth colour . More affordable and less invasive than dental crowns and bridges. Long-lasting, durable and can strengthen any damaged teeth. At Redlands Gentle Dental Care in Capalaba and Victoria Point, our main goal is to create restorations that look like natural teeth. To gain the full advantage of inlays and onlays, treatments factors such as the colour, shape and length of your natural teeth need to be considered. White fillings is a resin that can be applied where there is a significant gap between teeth, inlays and onlays can either be a porcelain or composite material that is most beneficial for repairing your teeth which may suffer from moderate amounts of decay. If you require an inlay/onlay it will involve taking a digital impression of your tooth and creating the desired restoration on the computer, that can then be fitted on the same day. Alternatively if you require an onlay that is made from gold it will take two appointments, this is required as we will need to take moulds of your teeth to a dental lab where your gold onlay will be tailored and then sent back to us. During this time we will provide you with a temporary onlay for the time being. An inlay is used to treat decay on the biting surface of the back teeth. Treatment takes two appointments: the first for an impression to be made and sent to the lab and a temporary placed. An onlay is similar to an inlay with one exception: onlays are also known partial crowns because they are used when there is more extensive damage. They also take two appointments to complete and are sometimes preferred over the slightly more invasive procedure of dental crowns. Inlays and onlays can be either made from porcelain, gold or composite material. The advantage of porcelain is that it can be matched to the colour and shade of your natural teeth for seamless appearance. 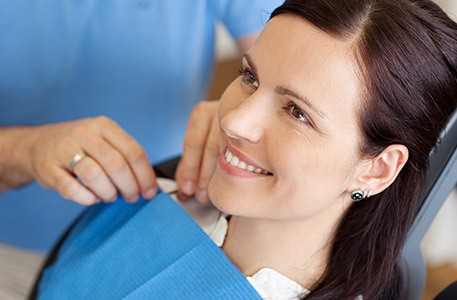 When it comes to the best restorative treatment for your oral health, one of our friendly team will assess your oral health and explain your options to you. One factor that will play a large role is the extent of the decay in your tooth. Redlands Gentle Dental Care offers a range of restorative dental options to ensure you get the best treatment for your oral health.